I love sandwiches, but it’s all too easy for me to get stuck in a sandwich rut, only mixing up the cheese type and a vegetable or two. Most lunches consist of turkey, cheese, sprouts, tomato, sometimes cucumber and/or bell peppers, on some sort of sandwich bread or roll. Tired of having the same old thing over and over, I recently hauled out my cookbooks in search of inspiration. Well, I found it. In this case, it’s a sandwich I’ve actually made (and enjoyed) several years back, before I’d even heard of food blogs. 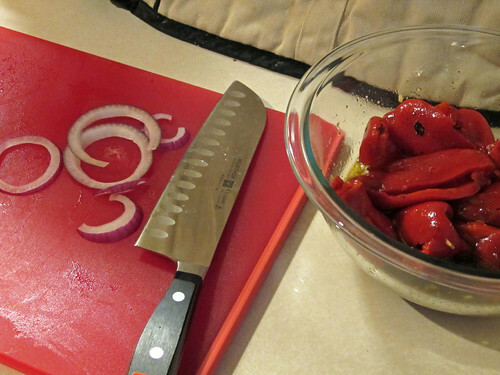 I took a big shortcut, having a jar of roasted red peppers just begging to be used. 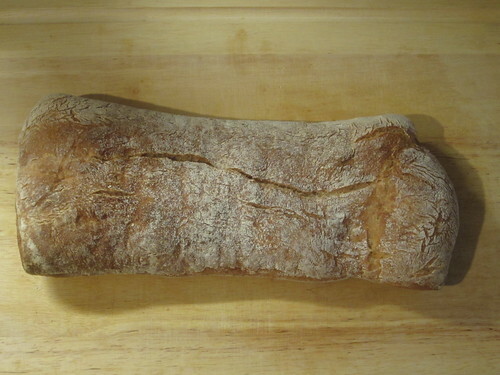 I also made a trip to Trader Joe’s, as I really enjoy their ciabatta. I find that too often, grocery store versions look a little sad. TJ’s ciabatta looks rustic from the outside, and when sliced has all of the nooks and crannies I want in my bread. And then there’s the goat cheese. Frankly, I adore the stuff. I will happily slather it on pretty much any piece of bread you put in front of me. It’s tangy, creamy, and provides such an interesting flavor contrast to so many ingredients. The original recipe calls for several large basil leaves, but I’m not a fan of raw basil, so I substituted parsley. I knew the parsley wouldn’t overpower the other ingredients, like basil would to me. This sandwich is perfect for a gathering, but also works for a bag lunch if you cut the bread into individual portions first, adding just enough cheese and filling for your serving. Note: it’s best to let the peppers and dressing sit for a few hours for the flavors to meld. Preparing this part of the recipe the night before would work well. If roasting peppers, heat oven to 500F/260C. Place peppers on baking sheet and roast for 30-40 minutes, turning twice, until skins are charred and wrinkled. Place peppers in a bowl and cover with plastic wrap for 20 minutes to loosen the skins. While peppers are cooling, combine oil, vinegar, garlic, salt and pepper in a medium bowl. Remove roasted peppers from bowl. You should be able to pull the skins off rather easily. Discard skins, then remove the stems and seeds. Quarter the peppers and add to the bowl with the olive oil. (If using jarred peppers, quarter the peppers and add directly to the bowl with the oil/vinegar mix.) Stir gently, then cover bowl with plastic wrap. Refrigerate at least 2 hours. 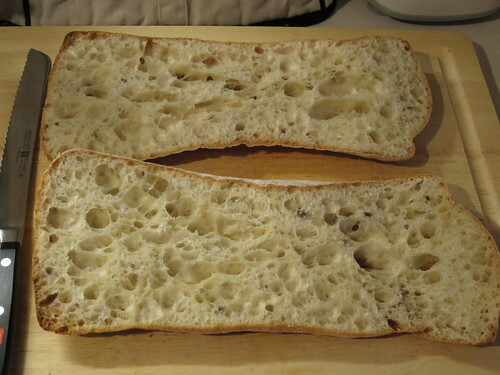 Cut the ciabatta in half horizontally. 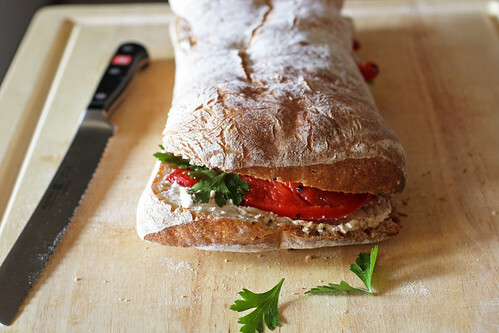 Spread the goat cheese on the bottom of the bread and top with the peppers, then the parsley. Spread with onion rings and season with salt and pepper. Cover with the top half of the bread, then cut into individual servings. I love this kind of food. 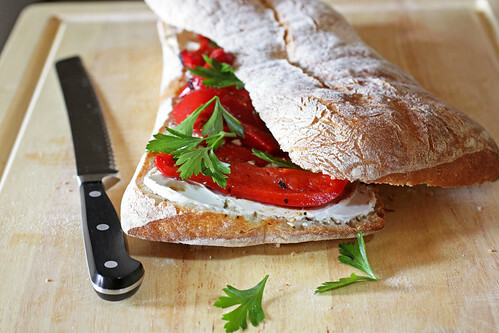 Goat cheese and roasted red peppers – there is nothing wrong with that! These look delish! Love the goat cheese and the photos are beautiful!